Specificity :Anti-ERK2 antibody recognizes the ERK2 protein. ERK2 from other species may also be detectable. 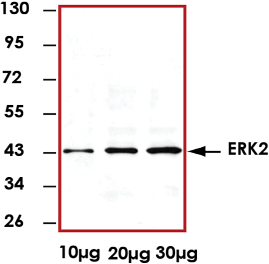 Sample Data :Representative western blot from 293 cell lysate using ERK2 antibody (1:2500). Scientific Background :ERK2 is a protein serine/threonine kinase that is a member of the extracellular signal-regulated kinases (ERKs) which are activated in response to numerous growth factors and cytokines (1). Activation of ERK2 requires both tyrosine and threonine phosphorylation that is mediated by MEK. ERK2 is ubiquitously distributed in tissues with the highest expression in heart, brain and spinal cord. Activated ERK2 translocates into the nucleus where it phosphorylates various transcription factors (e.g., Elk-1, c-Myc, c-Jun, c-Fos, and C/EBP beta). 1. Boulton, TG. et al: Purification and properties of extracellular signal-regulated kinase 1, an insulin-stimulated microtubule-associated protein 2 kinase. Biochemistry. 1991 Jan 8;30(1):278-86.